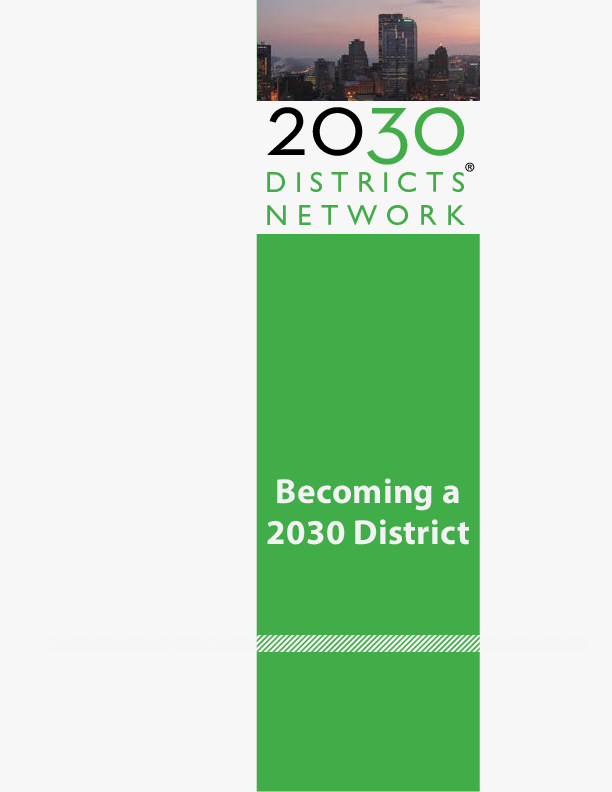 A Prospective 2030 District is formed by contacting the 2030 Districts Network and then establishing anexploratory committee. This committee consists of interested stakeholders who will provide outreach, guidance, and support for implementing the 2030 District model in their local community. These committees are self-created but care should be taken to have broad engagement with appropriate stakeholders. No one organization should control the committee and stakeholders should feel equal ownership. The group does not have a license to use the 2030 District name or mark. The Network will invite a group to move to the Emerging 2030 District status once the exploratory committee has active participation from a diverse set of property owners/managers and has substantive traction and support from local stakeholders. • City-specific enterprise account for email, file sharing , calendar, etc. 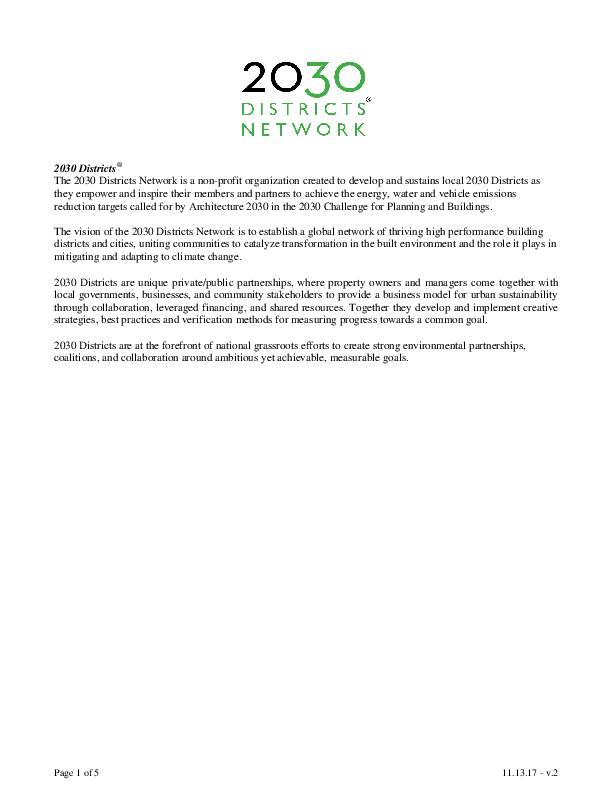 The Network moves an Emerging 2030 District to an Established 2030 District when the exploratory committee has agreed on a formal organizational structure, generated a critical mass of commitments from property owners and managers, and signed the official 2030 Districts Charter with the 2030 Districts Network. • A private sector led Advisory or Leadership Board/Committee with a minimum recommended composition of 40% property owners, managers, and developers, 20% professional stakeholders, and 20% community stakeholders. The roster should be kept up to date with the Network. 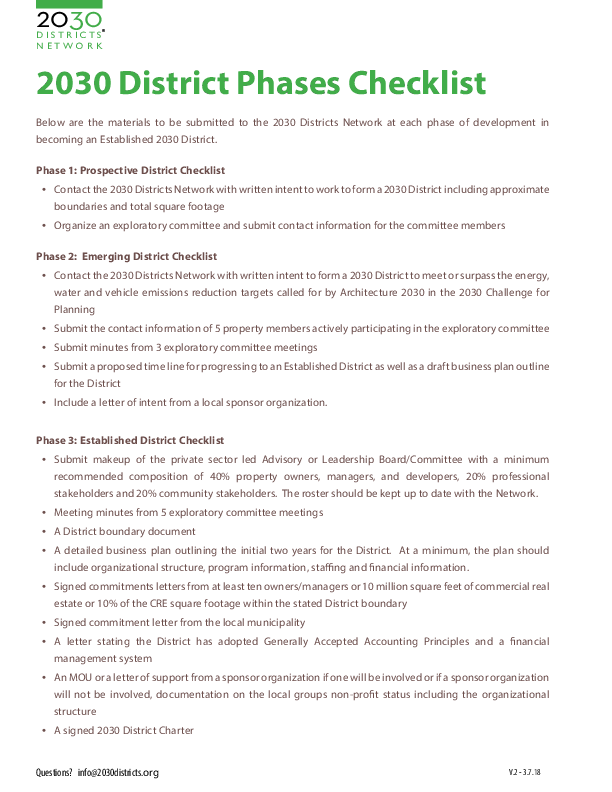 • A District boundary • A detailed business plan outlining the initial two years of the District. At a minimum, the plan should include organizational structure, program information, a competitive analysis of local sustainability and green building efforts, staffing and financial information.